Jane Arthurs, Professor in Television at Middlesex University, and Ben Little, Lecturer in Media and Politics at the University of East Anglia, the authors of Russell Brand: Comedy, Celebrity, Politics, explore celebrity politics using the eccentric entertainer’s journey from TV funny man to outspoken political figure. By the Autumn of 2013, UK politics had settled into an uneasy calm. The waves of unrest that had started in London with student protests and the invasion of Conservative Party HQ in 2010, and carried through into the rise of direct action movement UK Uncut and the Occupy LSX camp outside St Paul’s Cathedral. In August 2011 it culminated in five days of destruction and looting by disenfranchised youth, who trashed high streets across the country. This followed a pattern of similar protest and unrest across large parts of the world, co-ordinated through social media, but acted out in the streets and squares of world cities. There were ‘take the squares’ occupations across Europe, the spread of the Occupy movement from Zucotti park to financial districts across the world, and most significantly a tide of revolutions that swept the Middle East and North Africa known collectively as the Arab Spring. After the economic crash of 2008, austerity politics had imposed a solution to a problem originating in the deregulation of the US banking sector on those least responsible for it – the young and the poor. It seemed to create a shift in the nature of protest, aided by the organisational potential of social media. Indeed French philosopher and Maoist political commentator Alain Badiou declared that history had been reborn after lying dormant following the fall of the Berlin Wall in 1989 and a new revolutionary politics was emerging. By 2013 unrest following similar patterns was rumbling on, in Turkey, Brazil, Hong Kong and the growing strength of the #BlackLivesMatter movement in the US. But the disaster that unfolded from the Arab Spring, particularly in Syria, Egypt, Libya and Yemen meant that the hope that had accompanied these digital era revolutions had turned to anger and despair. 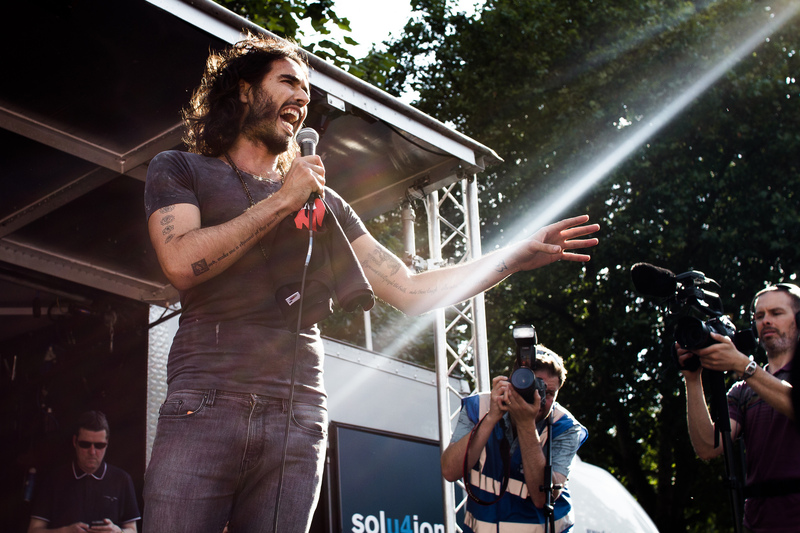 It was into this mix in October 2013 that Russell Brand, comedian, film star and media celebrity emerged as a key figure on the British political scene. Bursting into the nation’s political consciousness with an incendiary interview with Jeremy Paxman on the flagship show Newsnight, for a while at least, Brand seemed to reinvigorate the faltering revolutionary sentiment. With a passionate rejection of the politics of austerity and offering a sustained critique of the political establishment and the banking sector which had caused the crash, he attracted widespread attention and commentary in the mainstream media. From mid-2014 he built up millions of followers for his daily YouTube show The Trews culminating in Labour leader Ed Miliband choosing to appear on his show in a bid to court the youth vote immediately prior to the 2015 general election Yet, shortly after the surprise victory of the Conservative Party, Brand withdrew from political life with his only lasting legacy an important and instructive victory in the East London housing protests to whom he lent his fame, and his continuing involvement in drug rehabilitation and policy reform. These events offer a fascinating case study to explore how a celebrity of global stature can transform public debate and become an established symbol of activist politics and then disappear from view. Brand made the transition between the fields of entertainment and politics and across different media genres to develop the sort of flexible celebrity that enabled him to take centre stage in some of the biggest political debates of our era. Key to understanding his impact are the manner in which his political activism took shape, what influenced its intention and reception, and how, and to what extent, Brand’s prior identity as a comedian and ‘scandalous’ celebrity determined the outcome of his intervention. It is fascinating to see how his comedic and performance skills were adapted to political ends, first in his Messiah Complex stand-up show and then in the serious context of current affairs television and journalism. His involvement in direct action protests against the politics of inequality included speaking at a People’s Assembly rally in Parliament Square and engaging over several months with the women at the centre of the E15 and New Era housing protests in East London to promote their cause. He also opened a cafe run by ex-drug addicts in line with his advocacy of rehabilitation instead of criminalisation after an appearance at the Home Office Select Committee on Drug Policy and two BBC documentaries on the subject, motivated by his own experience of recovery from ten years as a hard drug user. His activism provoked extremes of hostility and admiration from media commentators and political activists alike. Becoming a controversial public figure is a potential route to political power for media celebrities. After all, the second largest party in the Italian Chamber of Deputies, M5S, is led by an idiosyncratic comedian with considerable similarities to Brand. And a reality TV celebrity with no political experience at all has become president of the United States despite hostile media commentary. When Brand first appeared on Newsnight his aim was to publicise an edition of the New Statesman he had guest edited. But the response, with 11 million views on YouTube, generated its own momentum. By the run-up to the general election in April 2015 Brand was the seventh most cited person in the media, ahead of all but the most senior politicians. Much of this coverage was negative of course with Brand berated as an entirely trivial distraction of no consequence, or worse as a harmful influence in discouraging people from voting. Conversely, he was seen by some activists and left-wing journalists as a potential political leader and conduit to reengaging a wider section of the population with politics. He was described in Prospect magazine as the most charismatic figure on Britain’s populist Left. Charismatic leadership is a form of affective power which the sociologist Max Weber identified as a creative force in history at times of crisis. By challenging the rationality of existing bureaucratic institutions through the irrational forces driving human action, charismatic leaders can bring about revolutionary change before another stable set of structures and routines is established. While the limits to Brand’s mobilisation of this potential are now apparent in hindsight, he articulated a growing opposition to austerity politics not represented in the mainstream parties. His humorous and passionate style also had a popular appeal that built on his existing skills and brand identity as a stand-up comedian and broadcaster. Scholarship on celebrity politics has drawn on the work of the sociologist Pierre Bourdieu to argue that celebrities have the promotional apparatus to create value in the form of ‘celebrity capital’, that enables them to migrate from the entertainment to the political field. But particular barriers have been identified that prevent celebrities on the political left from gaining mainstream legitimacy. While they may be able to operate in a limited way to help publicise specific causes, they lack what we might call (in the terminology of Gilles Deleuze and Felix Guatarri) the necessary political ‘apparatus’ to create an effective coalition of forces, an ‘assemblage’, to wrest power from established economic and political interests. Those on the right, while appearing to act on behalf of ‘the people’, more easily use their celebrity capital to intensify the appeal of political narratives and social hierarchies already promoted by the right wing media, such as an emphasis on immigration controls and patriotism. Thank you so much for your honesty and directness. It is very empowering for those living with the virus or those without. It is still amongst us but ignorance can be fought. Knowledge is impotant. Lets all keep the flag flying & live with Pride every day. Just stumbled across this blog there (I'm a fellow WordPress user). Didn't realise there was that much academic work on this subject, will definite give it a look as is this is a very interesting area, especially since the advent of social media etc. Now following!